A brazed aluminium plate-fin heat exchanger (BAHX) comprises a block or core with flow passages separated by flat plates known as parting sheets. The edges of the flow passages are sealed by side bars. Secondary heat transfer surface, or finning, is provided by sandwiching corrugated sheets (with the corrugations aligned with flow) between the parting sheets. The finning also gives strength to the block which is finished by brazing in a vacuum furnace. Carefully-placed gaps are provided in the side bars to allow the fluid streams to connect with headers which are welded onto the block. Distribution devices are incorporated into the block to ensure that the fluid stream is spread evenly over the full width of the flow path. BAHXs are typically designed to handle several streams in the same exchanger although they are also excellent devices for two streams. 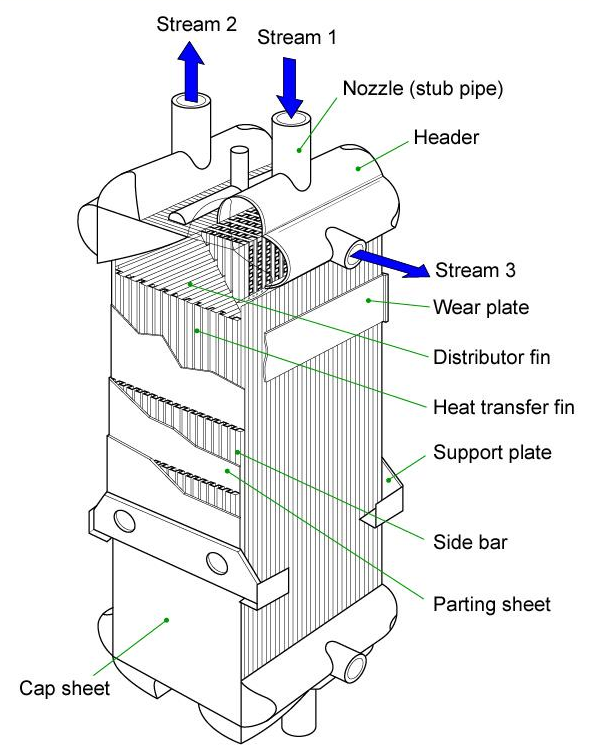 The figure below illustrates part of a typical exchanger. BAHXs can be built to withstand pressures up to and beyond 100 barg (1450 psig) and temperatures ranging from minus 269°C to plus 204°C (minus 452°F to plus 400°F).